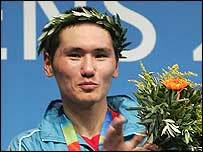 Olympic welterweight champion Bakhtiyar Artayev has been unveiled as the best boxer of the Athens boxing tournament. Artayev won the Val Barker award after ending his Games with victory over Cuban Lorenzo Aragon on Sunday. The 21-year-old Kazak, who had defeated Russian double Olympic gold medallist Oleg Saitov in his semi-final, won a 36-26 decision after a fierce contest. He dented an otherwise perfect day for the Cubans, who won each of the other three finals they contested. Yan Bhartelemy Varela, Guillermo Rigondeaux and Mario Kindelan added to two titles won by Cuba on Saturday. In This SectionKindelan ends Khan dreamVarela leads Cuba gold rushWard salvages US prideArtayev wins Athens awardEgypt suffer boxing blowHeavyweight crown for SolisGamboa takes flyweight goldSolis set for final battleDirrell shocks CubanThomas eyes flyweight crownZou wins medal for ChinaIran boxer 'tests positive'Irish boxer crashes outMakarenko ends Cuban runKenyan's appeal thrown outControversial fighter losesKhan stays amateurAmicable Amir targets BeijingOn the march with 'Amir's army'Khan's path to silver successRound-by-round: Khan v KindelanKhan's route to gloryKhan keeps gold dream aliveKhan-Yeleuov: round-by-roundKhan guarantees medalCommunity cheers Bolton boxer's successKhan crushes StilianovKhan wins openerAmir's road to AthensInt. Amateur Boxing AssociationEngland Amateur Boxing Assoc. Athletics: set fair or on the rocks? Will swimmers deliver next time?